WHEN Steven Arnold left TV’s Coronation Street it was in a dramatic tram crash, so he won’t be returning to the ITV soap any time soon – and that’s just the way he wanted it. 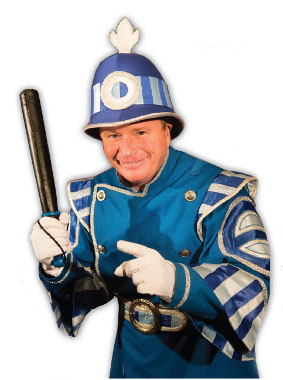 “I really wanted the character to be killed off because then you can turn a page in your life and start a new chapter,” explains the actor who played butcher Ashley Peacock and is now appearing as comedy policeman PC Pong in Woking’s major panto, Aladdin. “From the perspective of work, if that character is dead you are not related to him all the time, he’s gone. “When they told me he was going to go on the 50th anniversary for the live show I was over the moon. But, although he’ll never be back, Steven says he had a great time working on Coronation Street. “I made so many great friends and learned so much,” he says. “I was very lucky to be partnered with John Savident, who played Fred. He’s such an experienced actor and was very unselfish. “He taught me 90 per cent of what I know – he was incredible with me and we got on so well. I called him my second dad and he called me his surrogate son. He’s now partnered up with CBeebies superstar Justin Fletcher for the pantomime at the New Victoria Theatre, and says: “Pantomime is always one of my favourite jobs of the year. I’ve worked with [co-star] Justin Fletcher before on Justin’s House, so it’s great to team up with him again. “We’ll be doing our best to make sure the audience have a great time. Looking out and seeing a really mixed audience, with whole families having fun, is what it’s all about. Steven’s love of panto has come late as he admits he hardly went to the theatre as a child. “I didn’t really go when I was young except for one my dad took me to that had Ken Dodd in it,” he recalls. STEVEN and Justin are joined by A1’s Ben Adams and Britain’s Got Talent’s Shaheen Jafargholi in Aladdin, which will run at the New Victoria Theatre, Woking, until Saturday, January 10.